I have heard the phrase so many times I believed it was actually in the Bible. But when I looked for it, I couldn't find it! Have I been living my life struggling to meet an expectation that was never meant for me to obey? Am I as a Christians even supposed to be in the "world"? To answer these questions we must go straight to the source: the very Word of God. First of all, there is an obvious distinction made between two different types of people in the Word of God: Christians and the world (or non-Christians). Fundamentally, Christians and non-Christians have completely differing views of who Man is and who God is. Now, let's look at the phrase itself. What Christians mean when they say this is that a Christian is to be involved in the day-to-day tasks of the world. That means Christians are taught to involve themselves in the world's practices, such as athletics, schooling, politics, occupations, careers, and even most hobbies. Furthermore, we are taught that it is acceptable by God to drive the same vehicles as non-Christians, to watch the same movies, to shop at the same stores, to wear the same types of clothing. After all, we want to win the world for Christ, right? So the best way to do that is to be actively involved in the culture around us, right? The answer isn't as easy as you might think. In the first part of the often quoted phrase, the verb "be" is an active verb. It requires action. "In" is a participle used to indicate inclusion. Literally, the phrase is teaching a Christian to "be included in (a part of) the world." Essentially, we are traditionally taught to be different just enough so God believes we are obedient children. Go to church. Take notes during the sermon. But that's it. The rest of the week, do what the world does. Go to your job. Spend hours and hours pouring over numbers and making money. Go out to the practice field and blow your whistle at athletes until they run the play correctly. But make sure you tell everyone you have to leave practice early on Wednesday night to get to Bible study. Wouldn't want to miss that. "... but not of the world." Knowing what we know about the first part of the phrase, it can be clearly seen that this very phrase is a contradiction in itself. How can you be included in something one minute and then excluded of it the next? You can't. "But" is a conjunction that connects two ideas, showing a disagreement between the two sentence parts. "Not" is a word stating opposition to a particular action. "Of" is a participle used, in this case, to indicate identity - to be a part of something. So what does this second phrase mean? It literally is saying, "don't identify yourself with the world." The phrase then, when deciphered as a whole, is literally saying: "Be included in the world, but don't identify yourself with the world." According to the phrase, the question we must answer, then, is this: Can you be included in something and not identify with it? '"My food is to do the will of Him who sent Me and to finish His work," Jesus told them' (John 4:35). What is His work? To conform all people to His Image by redeeming them through His blood, shed on the cursed cross for our salvation. "If you continue in My Word, you really are My disciples. You will know the truth, and the truth will set you free" (John 8:31-32). Continue in the Word, not in philosophies taught by men. "I give you a new commandment: love one another. Just as I have loved you, you must also love one another. By this all people will know that you are My disciples, if you have love for one another" (John 13:34-35). This love can only come from God, not from the world. "You did not choose Me, but I chose you. I appointed you that you should go out and produce fruit and that your fruit should remain, so that whatever you ask the Father in My Name, He will give you. This is what I command: that you love one another" (John 15:16-17). Jesus has chosen us to be active in producing fruit - teaching others about Him. "I have revealed Your Name to the men You gave Me from the world" (John 17:6). In order that worldy men may be like Me. "I no longer am in the world, but they are in the world" (John 17:11). But for what purpose? To "Go into all the world and preach the Gospel..." (Matthew 28:19). "Go and make disciples, teaching them to obey My Words!" This phrase, taken as a paraphrase of Jesus' Great Commission to His Bride before leaving earth, says, in essence, "Take My Truth into the world. Stop trying to pretend you're a part of the way the world thinks and acts. You're not. You're different because I chose you to be different, because I set you apart. Don't conform to the world or have anything to do with the world; instead, stand firm on My Word, your Rock. Speak the truth against every vain ideology that the world teaches and take My Gospel to the dying world so that they might be conformed to My Image." It's time to redefine the American church. It's time to find our strength. It's time to find our voice. What is our voice? It is the Word of God! 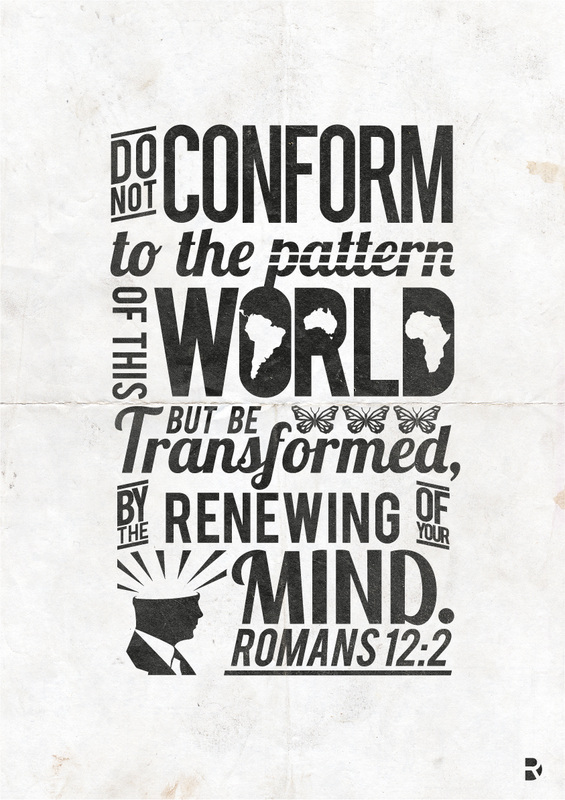 "Do not conform to the pattern of this world, but be transformed by the renewing of your mind" (Romans 12:2).